1) One of the most original and innovative Krautrock bands, Embryo fused traditional ethnic music with their own jazzy space rock style. Over their 30-year existence, during which Christian Burchard has been the only consistent member, the group has traveled the world, playing with hundreds of different musicians and releasing over 20 records. Originally a jazzy space rock group, Embryo was formed in 1969 in Munich, Germany, by former R&B and jazz organist Christian Burchard (vibraphone, hammer dulcimer, percussion, marimba), Edgar Hofmann (saxophone), Luther Meid (bass), Jimmy Jackson (organ), Dieter Serfas (drums, percussion), Wolfgang Paap (drums), Ingo Schmidt (saxophone), and John Kelly (guitar). However, the lineup was already different by the time of the sessions for their debut album. The resulting record, Opal (1970), is considered the band's masterpiece of their early, more psychedelic sound. By the time of Embryo's Rache (1971), the group was already adding ethnic touches to their music. fter touring Asia, the Middle East, and Egypt during the early '80s, Embryo released their first studio album in seven years, Zack Gluck, in 1984. The band then toured Africa and became involved with Nigeria's Yoruba Dun Dun Ensemble. However, after internal conflicts, Embryo split up. Burchard then continued under the name of Embryo with new musicians while a new group, Embryos Dissidenten, was formed. The band released 2001 Live: Vol. 1. 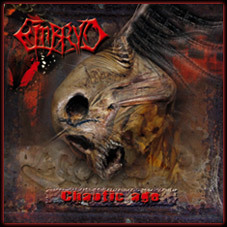 2) A Death/Thrash Metal band from Cremona, Italy, who has just released their debut album "Chaotic Age" on Officina Rock Records. 3) A '77 Punk band. 4) A new Israeli grunge band.